In 1820, Patrick Brontë was appointed incumbent of St Michael and All Angels' Church, Haworth, and arrived at the adjacent parsonage with his wife Maria and six children. 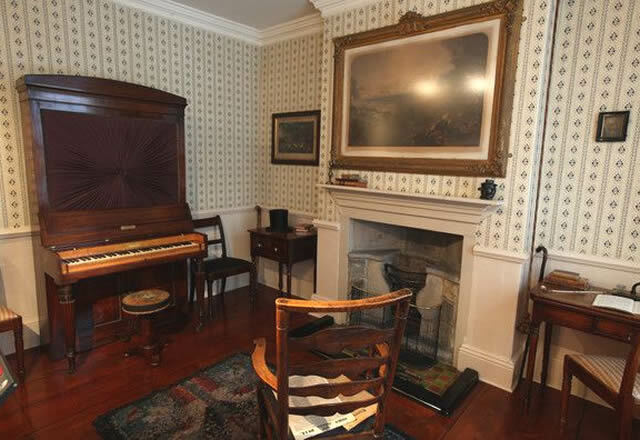 It was the family home for the rest of their lives, and its moorland setting had a profound influence on the writing of Charlotte, Emily and Anne. Patrick Brontë was a published author of poetry and fiction and his children grew up accustomed to the sight of books carrying their name on the parsonage shelves. On 15 September 1821, Maria Brontë died of cancer, and her unmarried sister, Elizabeth Branwell, came to run the household, exchanging her home in Penzance for the harsh climate of a bleak northern township. In 1824 the four oldest sisters left Haworth, to attend the Clergy Daughters' School at Cowan Bridge, near Kirkby Lonsdale. Maria, was sent home ill and died at the parsonage in May 1825, aged eleven. Ten-year-old Elizabeth was returned home shortly after and died on 15 June. In 1846 Charlotte, Emily and Anne used part of their Aunt Branwell's legacy to finance the publication of their poems, concealing true identities under the pseudonyms Currer, Ellis and Acton Bell. Poems was published by Aylott and Jones, but only two copies of the book were sold. Charlotte's first attempt at writing a novel for publication, The Professor, was rejected by several publishing houses, before Smith, Elder & Co. declined to accept it but were encouraging enough for Charlotte to send them her next work, Jane Eyre. It was accepted and published on 19 October 1847. Wuthering Heights and Agnes Grey had been accepted by the London publisher, Thomas Cautley Newby, and appeared as a three-volume set in December 1847. After Anne's second novel, The Tenant of Wildfell Hall, Charlotte and Anne were forced to reveal their true identities. Their brother, Branwell, who had fallen back on alcohol and opium for solace, had tuberculosis and died suddenly on Sunday 24 September 1848, aged 31. Emily was also dying from tuberculosis, and never left the house after Branwell's funeral. She died aged of 30 on 19 December 1848. Anne too had tuberculosis. She was taken to Scarborough to try a sea cure but died four days after arriving there on 28 May 1849, aged 29 years. Charlotte finished the novel Shirley, begun before Branwell's death. It was published in October 1849. Her last novel, Villette, was published in 1853. She married her father's curate Arthur Bell Nicholls in Haworth Church on 29 June 1854. She died on 31 March 1855, in the early stages of pregnancy, three weeks before her 39th birthday. 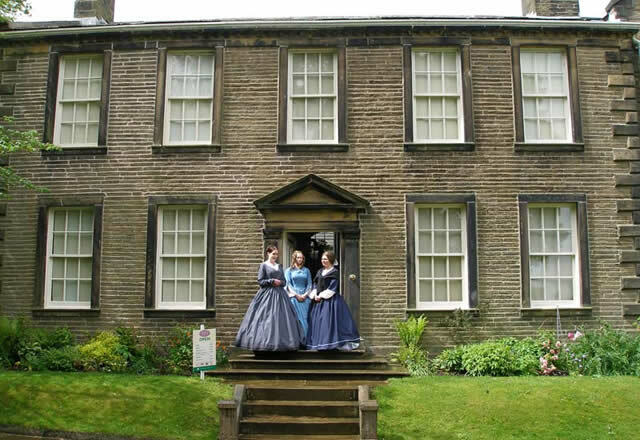 Patrick Brontë lived at the parsonage for six more years, cared for by his son-in-law, and died there on 7 June 1861, at the age of 84. Haworth's streets are steep, and Main Street is cobbled with the square stones known as 'setts', so it's a good idea to wear low heels or flat shoes when you visit. It's also hard work pushing a wheelchair up to the top! Disabled parking is available in the car park adjacent to the Museum, but there are steps between the two. The only access to the Museum itself by road is via Church Street, off Main Street, but because of the narrowness of the road, this can be accessed only as a dropping-off point, and not for parking. Visitors totally confined to a wheelchair may enter through the Admissions Door on Church Street free of charge, but unfortunately will not be able to gain access to the rest of the Museum. For those confined to a wheelchair some of the time, access to the Museum can be made via the Admissions Door, and then up four steps on to the ground floor, although the first floor will not be accessible. There are seats dotted around the house. Entry fees for disabled visitors and carers: If disabled visitors are able to visit only with the assistance of a carer, that carer is entitled to enter with them for free. Large-print room guides are available for those who would like to use them. Registered assistance dogs, or registered assistance dogs in training are welcome at the Museum, as long as they are house-trained. Other dogs are not allowed into the Museum. Trained first-aiders are on hand at the Museum at all times should visitors require assistance. The Keighley and Worth Valley Railway runs steam trains between Keighley and Haworth at weekends, bank holidays and daily in summer. Transport: Leeds (National Rail) then bus. Bradford Interchange (National Rail) then bus. Bus routes : Brontëbuses 500, 664 and 665 stop nearby as well as 27, 720, 916 and 917. Opening Times : Daily 10:00 to 17:30.